Being assessed and rated can understandably be a nervous time for educators. ACECQA caught up with Vashti Hicks, an Authorised Officer with the Queensland Department of Education and Training, to discuss her role and how services can prepare and embrace the assessment and ratings process. I have been in the early childhood sector for 16 years. I started as an assistant in a privately owned service but soon discovered that I wanted to focus on teaching. I then completed my diploma before taking on a group leader role. Following this, I had the opportunity to take on the role as a service Director, which I undertook for five years. I was lucky to stay at this service for 11 years and felt supported in my growth in the sector. After a short break, I took on a position with the department focusing on monitoring and licensing, I have been here for five years and am looking forward to many more. How do you think the National Quality Standard (NQS) has improved quality education and care? With the changes to the National Law and National Regulations and the development of the NQS, approved providers, educators and families have come together to ensure wonderful outcomes for children. 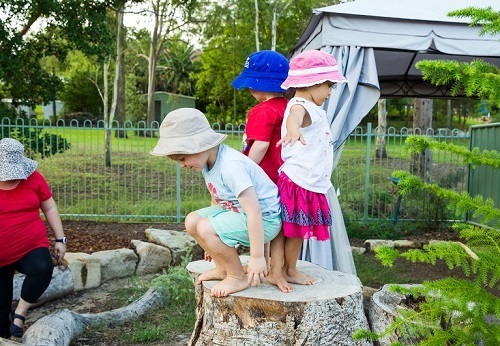 Services can think outside the box and engage their educators and children in new and exciting ways, which they may not have looked at in the past as early education programs tended to be structured and ‘one size fits all’. Additionally, with the law and regulations looking at operational requirements, it’s positive to see a framework that has raised the benchmark and for services to focus on continuous improvement. Can you describe some of the innovative ways you have seen services approach the Quality Areas or Standards? Services are embracing being able to change their indoor and outdoor environments to feel more natural and homely. Many are sourcing design ideas from collaboration websites such as Pinterest and finding inspiration for using natural materials that allow children to explore living and non-living things. I’m delighted when I visit services where the outdoor space has become equally as dynamic and important in terms of learning by using things like wooden materials, gardens and mud pits. We have definitely seen an increase in services and families building stronger relationships, including families participating more in the program, giving feedback and services using families’ skills and incorporating these into programs. One service that I visited had moved away from displaying children’s artwork on the walls to photos of children’s families that created a homely learning environment. What preparation do you do before a visit? I try to develop a relationship with my services to ensure that they are ready for the assessment and rating process. Prior to visiting I read through their Quality Improvement Plan (QIP) and identify strengths and improvements that they have highlighted and discuss these. If I have additional time, I call the service and speak to the nominated supervisor and ask if there is anything I need to know for the visit such as: allergies, staff that may be away or any other major changes that have occurred. Asking these questions makes me aware of how the service operates daily. I encourage services to make contact with their assessment authority before their visit as developing this relationship is an important step in ensuring the assessment and rating is as stress-free as possible. If you could offer services a word of advice, what would it be?